On the first week of June, Trivia Club's short yet exciting run at Gin Mill has come to a close! Indeed this is the last event for Toronto's Greatest Game Show at the former home of The Yellow Griffin! Before things wrapped up however, Anthony Couto became second most hostingest host of Trivia Club with this third occasion! We were more then happy to have Anthony as part of the Trivia Club family! It was an honour to have another person put their spin on the familiar format, and we really do hope we find Anthony the best possible location in the near future to continue hosting Trivia Club! 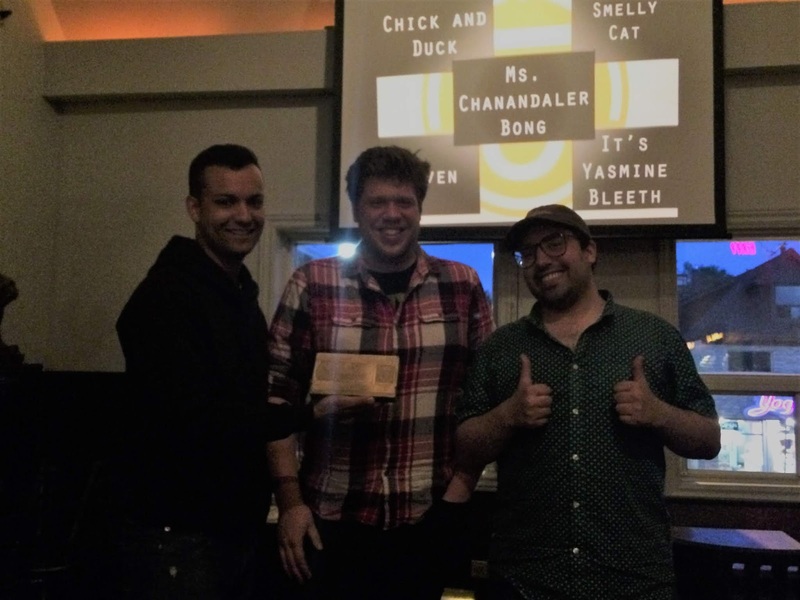 On this the final night of our first licensed Trivia Club, it was THE FREELANCERS who won the GOLDEN VHS CHAMPIONSHIP! It was fitting to have Lt. Dance alumni return once again to Gin Mill and win a Championship from their compatriot! They won the night with fifty points, over a pair of runners-up in Chewbacca and The Return of Melania, who both finished with zero points. Congrats once again to The Freelancers, and thank you again to everyone who came out to take part in Trivia Club this past Wednesday, and at every one of the three events at Gin Mill! Though Trivia Club will not be holding trivia events at Gin Mill any longer, we look forward to expanding the universe of Trivia Club into new locations with new hosts! Keep an eye out for more exciting trivia events throughout Toronto, and feel free to get in touch with Trivia Club for licensing, as well! Support Trivia Club on Patreon! Russel Harder hosts Trivia Club at Hitch (1216 Queen St East) every MONDAY, at The Rec Room (255 Bremner Blvd) every TUESDAY, every 1st & 3rd WEDNESDAY at Farside (600 Gerrard St E), and every 2nd & 4th WEDNESDAY at The Ace (231A Roncesvalles Ave)! Every FRIDAY, a new episode of the Pause & Play podcast (a portable version of our live events) is available on SoundCloud & iTunes!